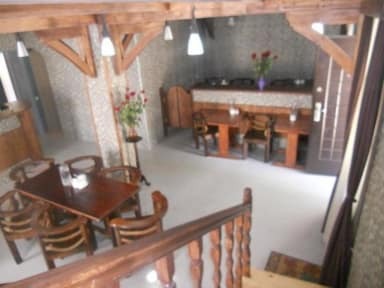 Nino Ratiani Guesthouse, Mestia, Gruzja : Rezerwuj teraz! Wszystko ok. Pokój czysty. Łazienka - jak na warunki hotelowe - też... Do centrum 5 minut. I chose Nino's Ratiani Gueathouse because so advertised "amazing cooking". Well it was far from it. And you got the same thing EVERY day. Even bread was stale (and bakery is like 3 houses away). The staff was really nice and rooms are clean, but you won't get good night sleep because you can hear everything going in and outside hostel (and Georgians do like to shout especially in late evening.